Yesterday’s news comes as a bit of shock, The news however of his health was nothing new, and of course the launch of the iPhone4S had given us the impression that all was well with our innovator of Tech. The details of Steve Jobs’ death has already been covered, and the history of his time at Apple goes without saying how influential he was and will remain. Death is a part of life, the escaping reality of our destiny. We don’t take anything with us, but we do leave something behind, Legacy. 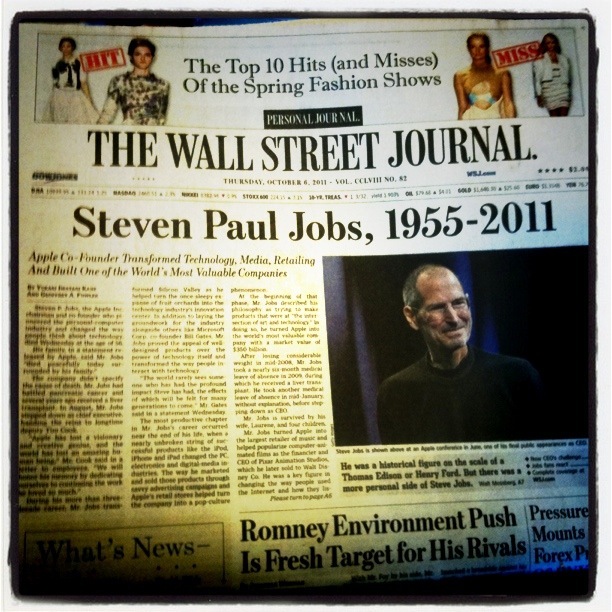 Steve Jobs, was not just the CEO of a tech giant, or a just a rich nerd who so happened to have a media spotlight. He was a beacon of passion and purpose, a role model who lead only by example. The legacy this man leaves behind just may be his greatest product. Even in his waking life he moved people to their very core with the possibilities of what one can do or make with their own lives, for the sake of touching and improving the quality life for others. Through the many inventions of Jobs, many of which at the time we felt we didn’t need, only wanted, those devices transformed the very way we conduct our lives. I cant help but notice the advances of someone who I called a role model, a person who grew to greatness, the thoughts that I express now ,could only be possible by the man who created the device I use to express them. Our world has seen many innovators and leaders, Thomas Edison, Albert Einstein,and Alexander Graham Bell all contributors to our world, and made our world smarter, brighter even easier to get through. Last Night’s Nightline, just hours after his death was announced,rewrote their entire broadcast to marvel with the rest of the world of his creations, the man we knew is now in the company of those who gave the world unique products and tools, but lead the world by showing us the power of an Idea. Bill Weir on Nightline said something that hit my though right on the nose, comparing our now late innovator to Thomas Edison with the charm and magic of Willy Wonka, he couldn’t have set it better! He changed even the way fashion was designed, designers started noticing the new attachment the mass market now had with tech toys, all major labels who carry any kind of case usually were designed with Jobs’ product in mind. From Diane Von Fursteberg to Louis Vuttion and Dolce & Gabbana all had either an iPhone, iPad, and iPod case, Ralph Lauren, another American great, had all accessories for Jobs’ entire line up of creations. I remember receiving my 1st computer at the age of thirteen, it was an iBook in the blueberry flavor. I remember being so proud of it, and even more excited for the fact that it could be carried with a built-in handle, much a like a chic tech handbag. Six iPods, three iPhones, and three MacBooks later, I still remain an apple techy. However I’m no tech guru, but the trend persona of what Jobs’ gave the company, made Tech toys a style, a quality of product that helped represent what kind of life we choose to live, sound familiar? Fashion much like Apple became a resonating ideal, a man’s vision in box, that showed others who we are or, who we hope to be. I have a small group of people i look up to, people who I like to say are the destination of who I hope to be. Oprah Winfrey, Ralph Lauren among others , one of which was Steve Jobs, a great man and a great example of how one can use their lives to serve the greater good. Steve as well partnered with Product (Red) to help BONO of U2 change the outcome of the AIDS crisis in Africa, a cause near and dear to my heart. All These are the examples that help lead future generations to greatness. I stopped in this morning at one of the most profitable Apple stores around DFW. Apple at Northpark Center has been my official location for all things MAC. The store was filled with the sacred silence of an event gone by, every monitor both desktop as well as hand-held devices all showing the Memorial Tribute of their leader. I met with an Apple genius ,as they are known, asking her what kind of reactions have they received since yesterday’s news. Some costumers did come in with the topic on their mind, she said. The Associate explained how the reaction had been calm for our area , but flagship stores such as in New York City were holding special memorial events and moments of silence in tribute. I couldn’t help but compare all this news, and coverage of his death to that of Micheal Jackson’s death in 2009, sales of Apple product are starting to rise. iPhone 4s may come to be known as one of the last full realized ideas of Jobs’, and of course the those famous keynote addresses that can only be compared to Woodstock gatherings will add to the demand of iPad2, which was one of the last presentations that Jobs made. This man will no doubt live on among the many innovators of our world, his ideas changed us, but his Ideal moved us in being able to “THINK DIFFERENT” in our own lives. I read this morning on CNN iReport, a women who was among others in NYC who gather to hold a special moment of silence, she expressed her thoughts by thanking Jobs for helping and changing the quality of life of her son. She went on to explain how her son has Autism, and would not communicate, until they bought him an iPad, that iPad become a window of hope for the family, her son now communicates every though he has. I found this very moving, how we use these amazing creations, and how the help shape and change future generations. 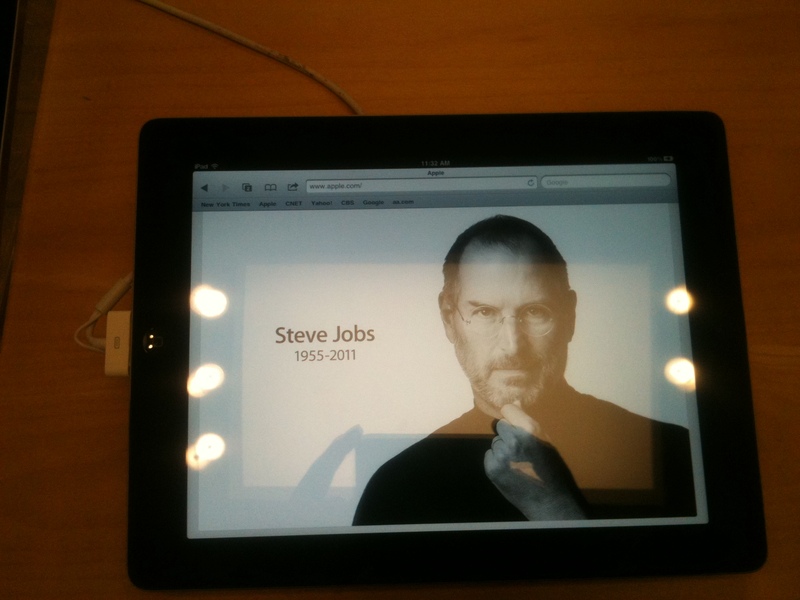 Steve Jobs has no doubt left a mighty mark in my mind, and an even greater mark on the world. Today I remember Steve Jobs, for many people thought (or maybe even still think), that this blogging platform in which I created, was a silly idea, but people like Jobs allow me to move forward, for I am not afraid to think different, and that is mighty lesson learned, and mighty ideal, set by a great man! This entry was posted in | and tagged Apple, DALLAS, DFW, fashion, iPad, iPhone, iPod, MAC, Macintosh, Ralph lauren Northpark, Steve Jobs. Tech. Bookmark the permalink.